Joanne White posted Sunday February 3, 2019. Luke Oldfield got the win last night in the BK Trading Australia Mayorâ€™s Cup at Toowoomba Speedway after taking the lead from Kerry Madsen with a spectacular outside passing move just a few laps from the chequered flag. Madsen finished second while Sam Walsh got the better of Jayden Peacock late in the race to snare the final podium position. Peacock, who spent most of the race in third, crossed the line in fourth after a brilliant run in the early laps of the race to advance from seventh, with James McFadden rounding out the top five. Qualifying got underway with the drivers divided into their heat groups for qualifying. Robbie Farr topped the leader board of group one, stopping the clock at 11.803 seconds, just marginally quicker than Kerry Madsen and Lachlan McHugh. Ryan McNamara impressed in group two, topping the charts with a quick 11.877 second lap ahead of Sam Walsh and Luke Oldfield, who both also made it into the eleven-second bracket. Group three saw David Murcott secure the quickest time, an 11.443, while Steven Lines, Jock Goodyer, Andrew Scheuerle, Danny Reidy, Jayden Peacock and Brett Minett all managed to get into the eleven-second bracket. Heat one started with Karl Hoffmans and Peter Lack from the front row, but it was Michael Saller from position three who dove underneath Hoffmans and Lack when the lights went green and tried to take control of the race for himself. Lack fought back around the high side and had the lead by the time they exited turn two, while Lachlan McHugh and Kerry Madsen fought over the minor places. Madsen eventually secured the advantage over McHugh and went on to challenge Lack for the lead in the closing stages of the race, but it was Peter Lack who got the win ahead of Kerry Madsen and Lachlan McHugh. Robbie Farr finished fourth ahead of Matt Dumesny, Michael Saller, Ben Atkinson, Brodie Tulloch, Karl Hoffmans, Geoff Davey and Shane Matthews. Brent Kratzmann secured the lead in heat two when the green flag flew, getting the better of fellow front row starter Scott Genrich and settling into the race lead. Luke Oldfield quickly charged around Genrich and set out after Kratzmann but a caution for the spun car of Nicholas Whell just one lap in brought the race to a stop. Kratzmann and Oldfield led the restart but another stoppage, this time for Wayne Rowett in turn two, brought the race back under caution. When the race resumed it was Kratzmann and Oldfield who again led the way and while Kratzmann had a small lead, it evaporated once the leaders approached lapped traffic. Oldfield was magnificent on the top side, racing around Kratzmann and taking the lead with just a couple of laps to run. Another caution, for the spun car of David Kenway interrupted the race once more but it was Luke Oldfield who got the win ahead of Brent Kratzmann, Marcus Dumesny, James McFadden, Sam Walsh, Ryan McNamara, Scott Genrich, Adam Butler, Wayne Rowett and Nicholas Whell. David Kenway did not finish the event. Jayden Peacock and Danny Reidy shared the front row for the start of the third heat, and while Andrew Scheuerle had a big look on the bottom it was Peacock who secured the lead. Brett Minett brought the race under caution one lap in, with Peacock leading them back to the green. Andrew Scheuerle and David Murcott had a brilliant battle for the minor places, with Steven Lines soon joining them and trading places back and forth with Scheuerle for a number of laps. Libby Ellis had a spin in turn four with two laps to run that brought the race back under caution, with Peacock to again lead them back to the green. Jayden Peacock got the win ahead of Jock Goodyer and Steve Lines, with Andrew Scheuerle, David Murcott, Danny Reidy, Brett Minett, Anthony Lambert, Nathan Black, Sean Rose and Libby Ellis rounding out the finishers. Robbie Farr and Kerry Madsen shared the front row for the start of heat four with Madsen securing the lead once the race got underway. Lachlan McHugh had a great drive on the bottom to move into third while Matt Dumesny and Michael Saller fought over the minor places behind him. Kerry Madsen went on to take the win ahead of Robbie Farr, Lachlan McHugh, Matt Dumesny, Michael Saller, Ben Atkinson, Peter Lack, Brodie Tulloch, Geoff Davey, Karl Hoffmans and Shane Matthews. Heat five started with Ryan McNamara and Sam Walsh from the front row with Walsh securing the lead while mid field James McFadden and Brent Kratzmann fought over minor positions. Luke Oldfield started making his way forward, quickly displacing McNamara, while David Kenway had a spin in turn four that brought the race under caution. Walsh led the restart from Marcus Dumesny and Oldfield, while Adam Butler and Brent Kratzmann traded places mid field. Another caution a few laps later soon followed, with Walsh leading the restart from Oldfield and Dumesny. McFadden made his way underneath Dumesny, only for Dumesny to spin to a stop in turn four. Walsh led the restart from Oldfield, McFadden and Kratzmann and while Dumesny made great progress from the rear of the field when the race resumed it was Sam Walsh who got the win ahead of Luke Oldfield, James McFadden, Brent Kratzmann, Ryan McNamara, Marcus Dumesny, Wayne Rowett, Adam Butler, Scott Genrich and Nicholas Whell. David Kenway did not finish the event. David Murcott and Steven Lines led the start of heat six with Murcott leading early but challenged by Lines as they rounded the first two corners. Murcott ended up extremely high on the track, surrendering the lead and a few additional places with less than half a lap complete, while Lines led from Jock Goodyer and Danny Reidy. Andrew Scheuerle soon displaced Danny Reidy, with Murcott quickly following, with a couple of cautions then coming in quick succession before restarting once again with six laps left to run and Lines leading them to the green. Steven Lines got the win ahead of Jock Goodyer, Andrew Scheuerle, Jayden Peacock, Danny Reidy, David Murcott, Anthony Lambert, Nathan Black, Brett Minett, Sean Rose and Libby Ellis. Lachlan McHugh won the Bronze shootout from Sam Walsh, Jayden Peacock and Jock Goodyer, but it was Robbie Farr who topped the leader board at the end of the Silver Shootout. Luke Oldfield secured second ahead of Walsh and McHugh, with both Farr and Oldfield transferring to the Gold Shootout. Former Australian Champion Kerry Madsen got the win in the Gold Shootout, with Luke Oldfield second ahead of Robbie Farr and Steven Lines. Danny Reidy and Matt Dumesny shared the front row for the start of the B-Main, with Dumesny quickly securing the lead when the lights went green. An early caution for Sean Rose followed soon after the start, while Brett Minett made his way past Adam Butler. Danny Reidy and Ben Atkinson had a fierce battle over the minor places, trading places back and forth a couple of times. Deep in the field Brodie Tulloch started making his way forward, while Libby Ellis had a great run in the NQ73 racer at the rear of the field. Matt Dumesny got the win ahead of Danny Reidy and Ben Atkinson, with Anthony Lambert securing the final transfer to the A-Main. Brett Minett finished fifth, while Brodie Tulloch made his way into sixth by the fall of the chequered flag, leading Adam Butler, Nathan Black, Wayne Rowett, Karl Hoffmans, Nicholas Whell, Geoff Davey, Libby Ellis, Shane Matthews and Sean Rose across the line. David Kenway was having a great run in the NQ26 racer in his first race back after some time on the sidelines, but a mechanical issue saw him pull out the race with three laps left to run. Kerry Madsen elected to start the A-Main from position two, favouring the high line and leaving Luke Oldfield from pole position. Madsen quickly secured the lead in advance of Oldfield, while Robbie Farr got the better of Sam Walsh, with Jayden Peacock closing in fast. It only took five or six laps for the leaders to reach lapped traffic, with Oldfield capitalising and sliding straight underneath Madsen to take the lead. Madsen quickly fired back to regain control, while Lachlan McHugh got underneath Steven Lines as Lines began to fade a little. McHugh and David Murcott went on to have a thrilling battle mid-field, but all eyes were soon back on the leaders as Oldfield began challenging Madsen for control once more. Oldfield and Madsen traded places a couple of times before Oldfield raced around the top of Madsen with only a handful of laps remaining. The thirty-five lap affair ran the entire duration without a stoppage, with Luke Oldfield getting the win ahead of Kerry Madsen, while Sam Walsh eventually got the better of Jayden Peacock to secure third. Jayden Peacock finished fourth with James McFadden finishing fifth after initially starting the race from position sixteen. Jock Goodyer was sixth across the line ahead of Lachlan McHugh, Robbie Farr, David Murcott, Steven Lines, Matt Dumesny, Brent Kratzmann, Michael Saller, Andrew Scheuerle, Peter Lack, Marcus Dumesny, Ben Atkinson, Danny Reidy and Ryan McNamara. Anthony Lambert was the only driver who did not finish the event, pulling out of the race after completing just twenty-one laps. 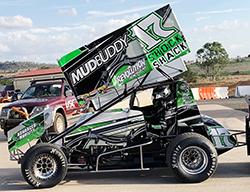 Sprintcars Queensland will return to Ausdeck Patios and Roofing Archerfield Speedway next Saturday night, Saturday 09 February 2019, for another night of spectacular Sprintcar racing. See you there.